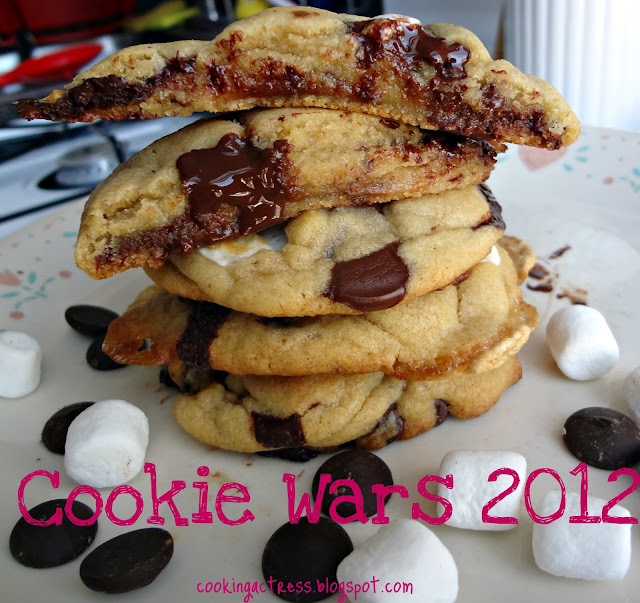 The Cooking Actress: Browned Butter Dark Chocolate and Marshmallow Cookies-Cookie Wars 2012! 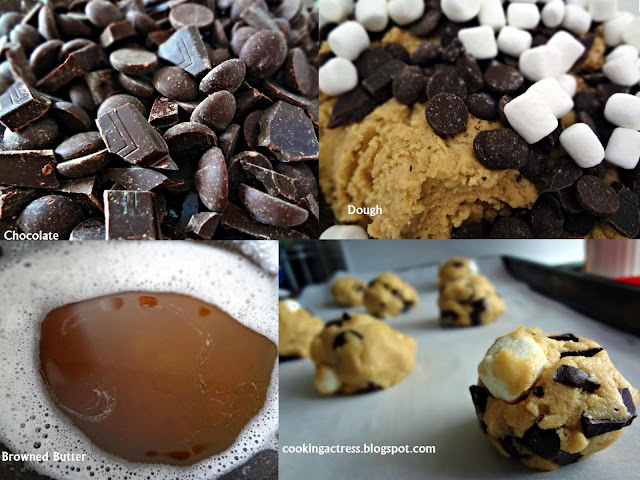 I chose to make cookies featuring dark chocolate and marshmallows. Admittedly, I'm playing it safe. However-I am a picky eater. And I wanted to like whatever cookies I made, so I went with ingredients I knew I could make work and that I would want to eat. Then I had to decide what base recipe(s) to use. I'm still pretty infatuated with these cookies I made, and I (like everyone else) am also obsessed with browned butter. And something in my brain just clicked with that combination. I was giddy with excitement. I made sure I had enough mini marshmallows (I did), I decided to use some of the best dark chocolate I had at my disposal, and I decided to only brown half the butter in the recipe (partly so it didn't interfere with the texture to too much of a degree, and partly to have a little more balance with the browned butter flavor). Umm...OMG. These were so delicious!!! 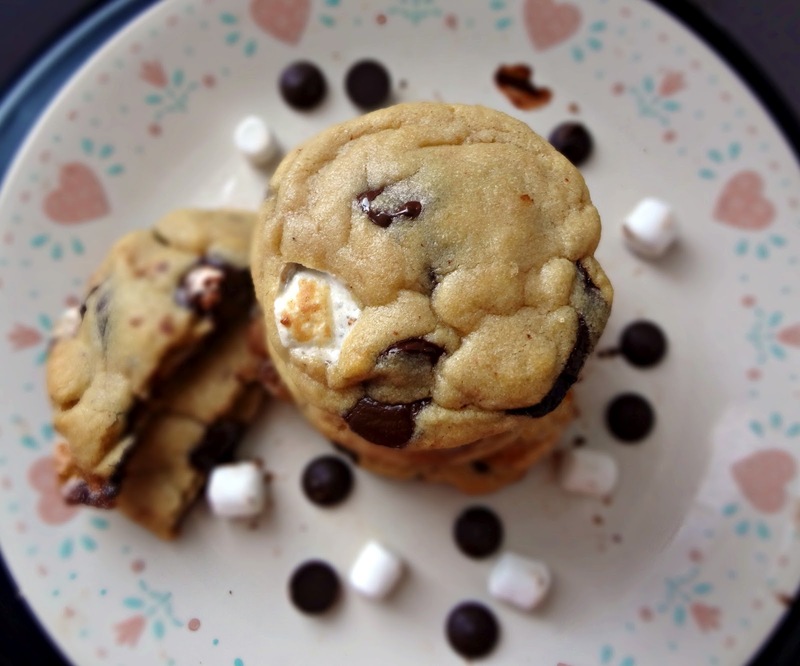 Something about the combination of the nutty browned butter and the sweet marshmallows formed a great, complex, caramel-like flavor, and then the bite of that melty dark chocolate just tied the whole thing together. 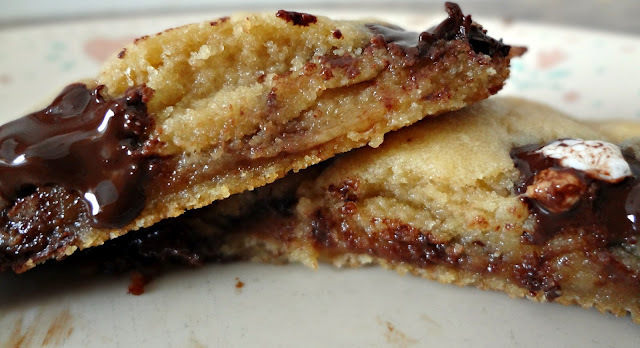 The flavor is so warm, and the overall cookie is so gooey, but with great texture. I could not stop eating these. I just ate the last of them a few days ago, and I'm very sad that they are gone. One of my favorite cookie recipes, for sure. Michael loved them too-he said he liked that the browned butter was more subtle, and that the marshmallow and chocolate balanced each other. In my opinion, this tasted a little like a very sophisticated s'more. Makes 18-26 cookies, depending on size. Prepare cookie sheets with parchment paper/silpat. Preheat oven to 375 degrees. Brown 1 stick butter in a small saucepan. Melt over medium heat, then continue to cook-whisking constantly-until it foams up and then turns brown, with little brown particles (this should take 5-10 minutes). Remove from heat immediately and allow to cool completely. In a large bowl, cream cold butter and sugars. This is easiest if you use a stand mixer, but it will work with a hand mixer-it's just more difficult (I had to get in there and break up the butter with my hands periodically). Once fluffy-ish, mix in the browned butter. Mix in flour, salt, cornstarch, baking powder, and baking soda. You want the dough to be very thick, continue to mix in additional flour until the dough is not sticky. 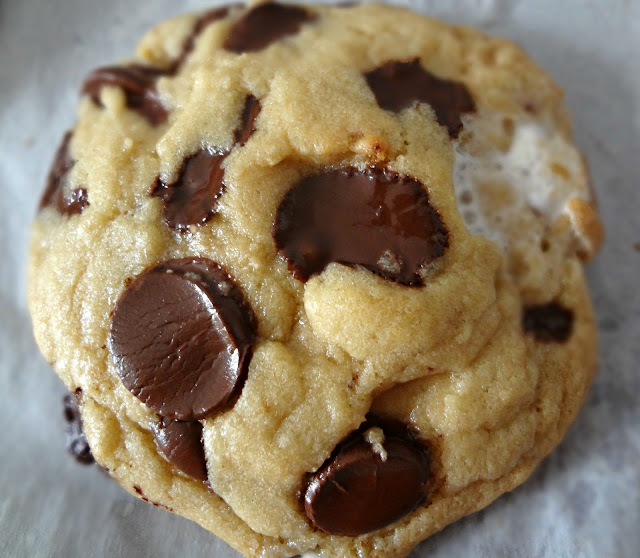 Add chocolate and marshmallows (make sure that if there are little chocolate shavings/crumbs that you get all that goodness in there), knead into the dough with your hands. Form dough into large, golf-ball sized, balls and place on cookie sheets--leave plenty of room between!! You may have to bake these in batches (I had a constant rotation of one pan in oven, one ready, etc.). Let cool a few minutes and then remove from the pan (I kept mine on parchment paper until they firmed up a smidge, then moved them to cloth napkins to finish cooling). Make sure to eat at least 3 of them while warm and fresh. I am linking here,here,here, here, and here. this looks awesome. when my daughter gets back from school, this is a must try. They're so delicious-she's gonna love them! These look amazing and very creative. I totally want to get in on this. Can anyone join cookie wars? I have a great idea for a cookie that includes sweet potatoes. Okay, not ONLY are your pictures beautiful, but you made some divine sounding cookies! I would totally gobble these up and I'm not even much of a chocolate fan. But, throw in some marshmallows and we've got a date. Add browned butter and I'm in HEAVEN! I'm so glad that you like this! These are super super amazing. I promise!! Oh how I love cookies!! I am happy to tell you that I've nominated you for the Versatile Blogger Award! Please visit my blog for all the details! Wow, these look amazingly tasty! Cookie wars, what a great theme! Also these look like you were definitely up for the challenge. I love the texture of these and all those goodies poking through are calling my name-yum! Simply delicious post. These look awesome! Can't wait to whip them up and see how they turn out! I'm so glad you entered and thanks for advertising the contest! Thanks!!! I hope you like them as much as I did! They look awesome, I am wanting one bad : D Awesome photos! You win!!! These look amazing! I wanna make these ASAP. Pinning them now! These look so good! They're gorgeous and I want to eat them! YUM! I made these today, they were great! I substituted semisweet and milk chocolate chips because I am not a fan of dark chocolate. These will get made on a regular basis! Browned butter is just regular butter that you cook (melt in a saucepan over medium heat) until it turns brown. It's amazing, I promise! These look so phenomenally delicious -- it's just crazy! Okay, here's my update. I just made these tonight. To combat my oven-flattening problem, I baked it all up in a springform pan. It was awesome! I'll definitely be posting about this one and will let you know when I do. Kayle these look amazing! 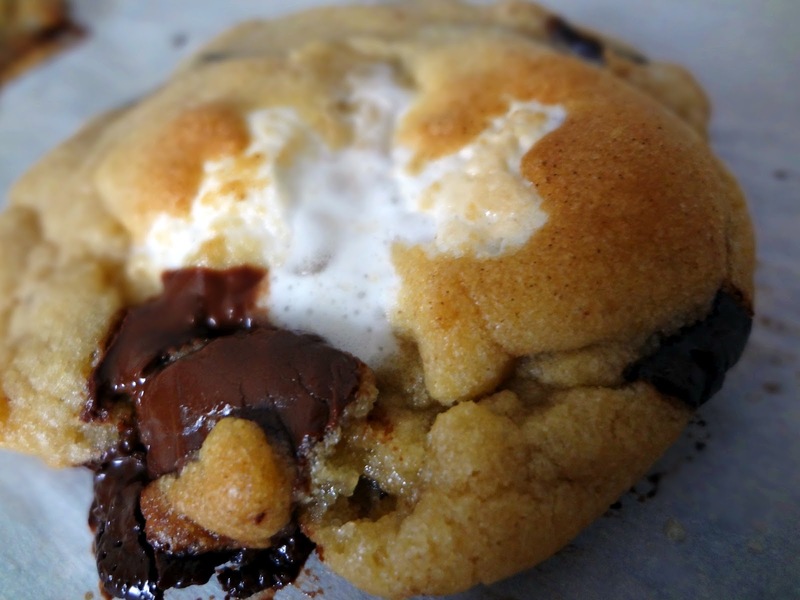 Wow - they are perfect in every way from the browned butter to the marshmallows to the dark choc! Aw that's so sweet, thank you! Glad to have you as a reader, enjoy all the delicious cookies!!! Gorgeous cookies, Kayle! I will be attempting to make these in muffin form today. Wish me luck! I'm thinking of sending these. Will they last for a few days? Seems bettter if eaten while still warm. Would a 10 second microwave blast help or hurt? How do they taste cold. Hi Amelia! Yes they will last for a few days--to keep them extra fresh, freeze them after they're completely cooled in a ziplock bag. When you're ready to send them take them out of the freezer and maybe put them in another ziploc-keeping them as airtight as possible helps. And I always heat cookies up for about 10 seconds in the microwave because I think they're always better warm :) They're good cold or room temperature also, though!